Through a collection of case studies, GIZ GmbH and SAIIA aim to provide concrete examples of constraints to doing business in the SADC region, as well as potential solutions. In 2011, the SADC Secretariat in collaboration with Deutsche Gesellschaft für Internationale Zusammenarbeit (GIZ) initiated a research and dialogue project to identify the most significant constraints to doing business in the SADC region. The idea was to make these more tangible – beyond the desk research stage, by conducting firm-level case studies on the identified constraints. In a second phase of this project initiated in July 2013, GIZ ProSPECT and SAIIA aimed to further develop the practical component of the work undertaken in 2011. Based on the desk study results which identified the top 10 barriers to doing business in 2011, the project team prepared to assess the level to which these ‘academic’ barriers actually played out in the real world. The team drew in the interest and support of the regional business organisations (RBOs) which represented a wide range of sectors – from agriculture; mining; transport and trucking to financial services pharmaceuticals and tourism. The RBOs and their members were first involved to determine the major obstacles they faced in doing business regionally; while the next objective was to try to involve these businesses in advocacy processes which had the ultimate effect of eliminating, or at least reducing business obstacles in the SADC region. 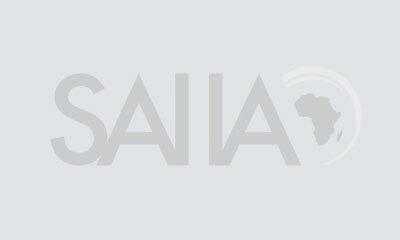 Case 5, SADC Univisa: Why the Lack of Progress? Through this collection of case studies, GIZ GmbH and SAIIA aim to provide concrete examples of constraints to doing business in the region, as well as potential solutions. The overall objective of the research is to reduce these business constraints by facilitating a dialogue in the SADC region on how to remove these barriers. This will allow the private sector to take advantage of the opportunities that offered by regional integration. The case considering Access to and Cost of Finance in Agriculture saw the involvement of several development finance institutions and international cooperating partners. This ground-breaking public-private sector dialogue used the opportunity to bring together two business sectors, agricultural traders and financial services providers, to bring to closer alignment differing perspectives on financing for agriculture in Malawi – although there were lessons for most SADC countries. Also in agriculture, focused on the sugar industry, the research considered regulatory frameworks for the development of biofuels, specifically ethanol, in the region. This case considers enabling regulatory requirements and existing constraints to the development of a regional market for ethanol. Nonetheless, the sugar cane industry holds enormous promise for the region, if there is strong consistent advocacy for this development. The case on alternative energy for mining has also seen a positive movement towards using hybrid diesel, with solar energy. While the uptake is still small in local mines in South Africa – especially given the difficulty with electricity generation outside of the Eskom grid – there is reason to expect that these hybrid energy solutions will be taken up in mining operations in SADC – outside of South Africa in the medium term. The capacity to regulate the pharmaceuticals sector in the SADC region faces a number of challenges. There is limited scope for the growth of a local pharmaceutical production sector, especially in light of India’s dominance of generic manufacturing. Local industries are challenged by the presence of imported generics and with the control of the sector by big brands, there is a call for renewed regional and national commitment to pro-poor policy, particularly for health care, will benefit those communities and citizens that need it most. Visa policies are among the most important governmental formalities influencing international tourism. The development of policies and procedures for visas is closely linked to the development of tourism. With the swift growth of international tourism in the last six decades, the quality, reliability, and functionality of visa and other travel documents have evolved.’ However, the UNWTO also points out that Southern Africa is lagging in terms of opening its visa procedures and scores only 29/100 in an ‘openness to tourism’ scale. Research and exposure to data on the benefits of visas upon arrival and e-visas could encourage SADC officials to learn from SADC’s Transfrontier Conservation Areas (TFCAs). Transporters involved in transit operations (where goods are brought into a country for the sole purpose of transporting to another country) are required to purchase a customs bond at least equal to the duty payable on the cargo, for each border crossed. This case considers the work done by various regional economic communities, including SADC and COMESA, on the development of a regional transit bond which allows for multiple entries into intended countries – but which needs to take into account the various stakeholders currently involved in operating and receiving revenue from the current model. 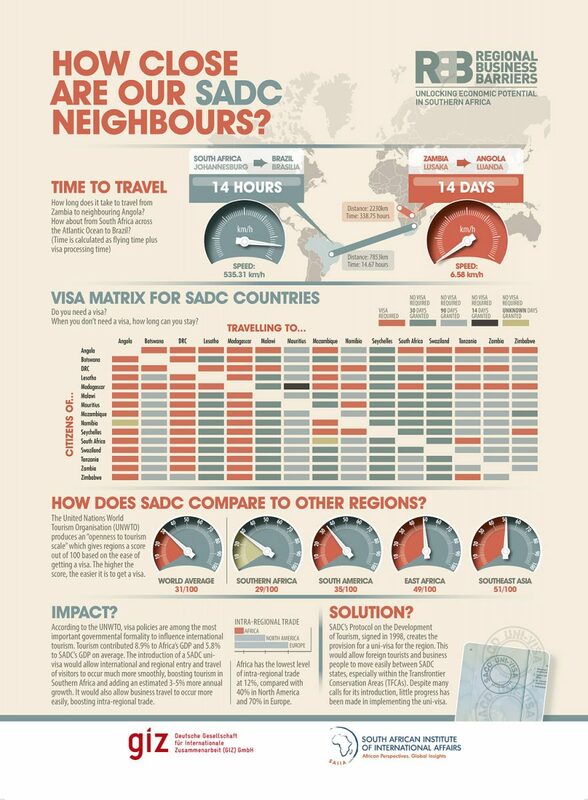 SAIIA has developed a fascinating infographic to illustrate how the SADC region fares in terms of visa policies. Click on the image to see the full infographic. It is estimated that over 400 trucks cross the Beit Bridge border post every day. These trucks experience a delay of approximately 3 days crossing the border, although the delays can extend up to a week. Truck drivers have reported being delayed for up to two weeks at times. The delay is approximated to cost US$400 per truck per day. The Road Freight Association of South Africa has estimated the annual cost of delays to be $100 million. The project team has taken this case up as one which needs to be elevated in terms of government, public and media attention to ensure the current high costs and significant delays can finally be addressed. The Non-Tariff Barrier (NTB) Monitoring Mechanism allows private sector actors in SADC (and further throughout the Tripartite area) to lodge NTB complaints on an online database, which are then forwarded to the country involved to be resolved. NTBs in the SADC region reported on the Monitoring Mechanism affect products that jointly account for $3.3 billion, or one fifth of regional trade. While the online database has been relatively successful at allowing private sector actors to register complaints, the resolution process of identified NTBs has been far less effective. NTBs registered on the database either take too long to be resolved, or are not resolved at all. Where perverse incentives or a lack of political buy-in exists, the demonstration effects of gains for NTB elimination can contribute to building positive political momentum for reforms. Improved transport and logistics infrastructure can lead to greater trade facilitation which means that private sector companies conducting cross-border trade can achieve economies of scale and become increasingly competitive in the global economy. While the development of roads, railways, seaports and airports are a longer-term endeavour, ensuring sufficient storage capacity for goods in transit; network linkages between sea- or airports and corridors; management oversight and professionalism at ports; and efficiency in operating existing infrastructure assets may go a long way towards benefiting trade – across all sectors. Recent infrastructure developments in Namibia spearheaded by the Namibian national ports authority (Namport) and the public private partnership of the Walvis Bay Corridor Group are examined with a view to establishing what level of commitment from both the public and private sector is required to push through trade-facilitating infrastructure development. Research and advocacy has resulted in nine case studies which outline the business obstacles as described by members of private sector in their specific industry; the way in which this obstacle inhibits their ability to do business in the way they would prefer; and in most instances possible solutions including stakeholders who could assist in eliminating or lessening the impact of the business obstacle. Efforts have been made to present practical solutions and we have seen how the media can be utilised in highlighting the importance of the more efficient processes for doing business in the region. The growth of the private sector is recognised as important to unlock economic growth in the region and overcoming the significant barriers sometimes takes innovative thinking and some new pressure points. Over the past three years, the South African Institute for International Affairs (SAIIA) has worked on this project in the first instance, through identifying the top 10 business constraints in the SADC region based on a sample of business and investment climate surveys over several years; conducting case studies on specific firms operating in the SADC region that are experiencing one or several of the identified constraints; and initiating public-private dialogue on the basis of the case studies in order to develop practical solutions to the identified constraints. During the first phase, 90 interviews were conducted with firms located in the SADC countries and 45 firm-level case studies were eventually vetted, and published. These cases have been made available for utilisation in policy dialogues in SADC in order to enable participants from both the public and the private sector to identify policy areas with the most urgent need for change and provide suggestions for concrete solutions. As expected, the practical barriers identified by the private sector players in 2013/2014 did indeed coincide strongly with the results uncovered in the first phase of the study. The project has tried innovative approaches to highlight the problems and to promote possible resolutions to these problems. For that the team has relied on the ongoing input from the RBOs and their members, but also there has been similar engagement from a variety of collaborating institutions.